The school organises Hindi Natya Utsav. 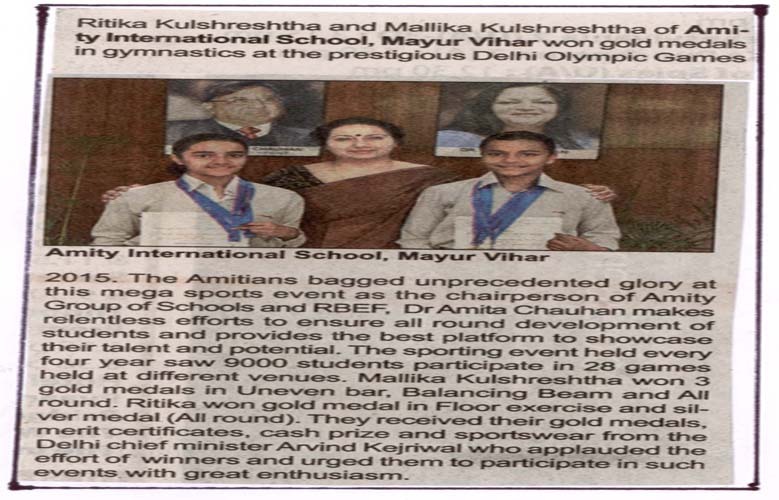 The competition was limited to dramas in the Hindi language and was presided over by Dr. Indu Jain and Dr. M K Pandey..
Education world ranked Amity international school Mayur vihar as no 1 for innovative teaching. Amity International School Mayur Vihar has been ranked 3 in Delhi on the parameter of Academic Performance. Two students were awarded an all-expense-paid-three-week scholarship to attend a language camp in Germany. 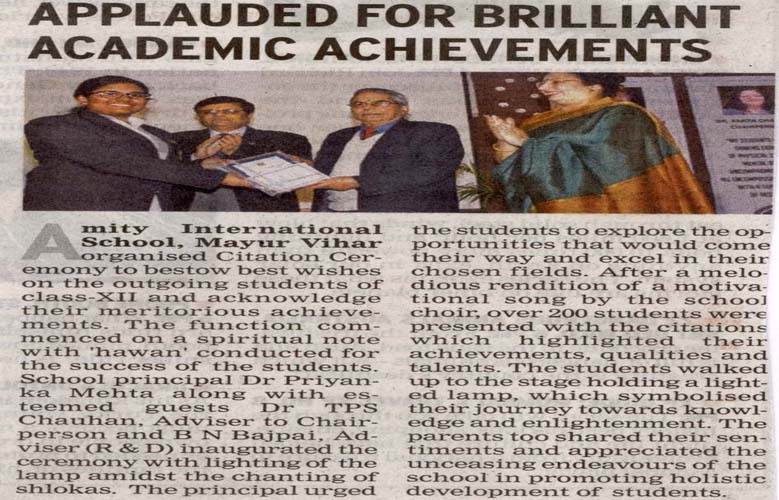 The school organized a citation ceremony to bestow best wishes on the outgoing Class XII students and acknowledge their meritorious achievements. 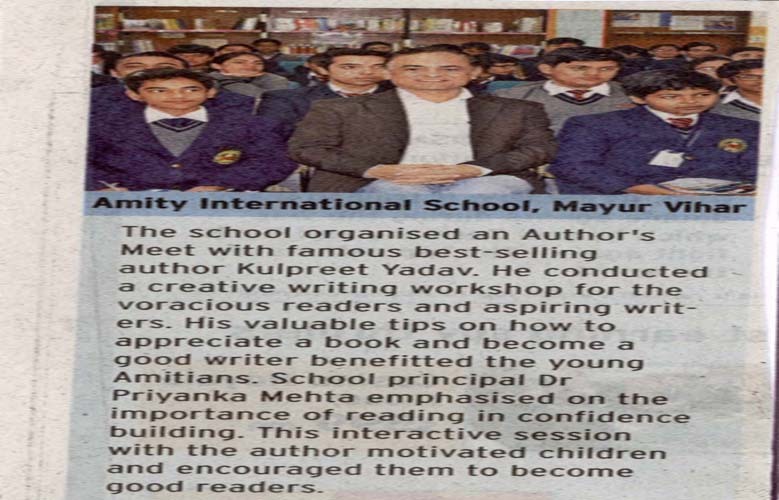 The school organized an authors meet with famous best selling author Kulpreet Yadav. He also conducted a creative writing workshop and gave valuable tips on how to appreciate a book and become a good writer. The school held the investiture ceremony for its newly elected 130 member Students Council. The school heralded winter with a carnival enjoyed by students and their families. The school conducted an Indian-German classroom project with Gyula Trebitsch Schule Tonndorf, Hamburg. Students from both the schools got an opportunity to understand Indian and German culture. The school organized a ‘Mathamity and Vasudha Science Exhibition’ on the theme ‘Inspire, invent and innovate’. The participants showcased innovative projects, charts and models covering topics such as stealth thermal energy in aeroplanes, minimizing agricultural loss due to floods, finding the formulae for circumference and mathematics in biometric devices. The school celebrated Sanskrit week with a grand fiesta ‘Subhashika’ – an inter amity Sanskrit competition. Aakriti Datta, Soofia Ahmed and Kriti Garg qualified for Golden Climate International Environment Project Olympiad (GCIEPO) to be held from April 29 – May 2, 2015 in Nairbo (Kenya).